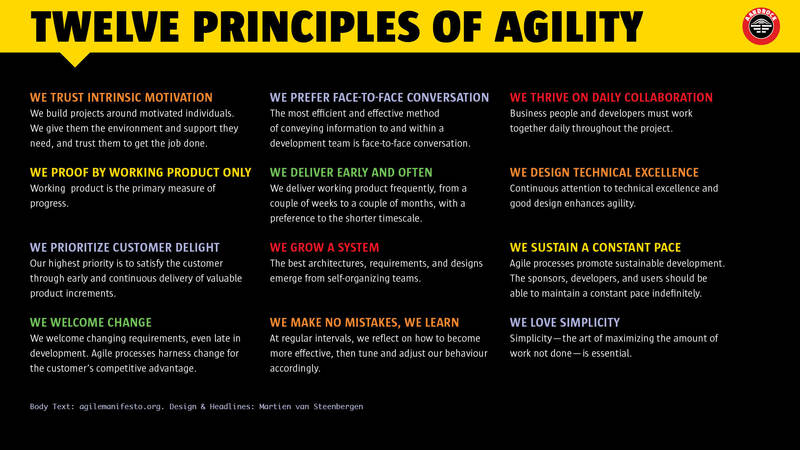 The Agile & Lean world often focuses on coaching and leading continuous transformation. Some people always feel somewhat uncomfortable with words like transformation and change, as they often imply people and organisations compelled, coerced even, to change and transform. How about moving towards coaching and leading continuous development? Plus, development is of greater concern to a transformational leader than growth (or change, or transformation). is infinite (rather than finite). 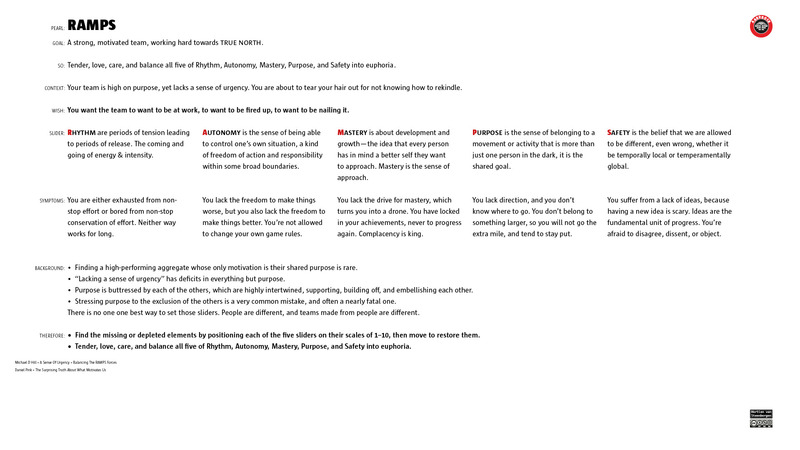 RAMPS—Rhythm, Autonomy, Master, Purpose, Safety cheatsheet. Click here or on image above ↑ for PDF. Michael D. Hill introduces RAMPS as a motivation model: Rhythm, Autonomy, Mastery, Purpose, Safety. Michael even goes deep on Mastery as Motivator: The M of RAMPS. Next, Ron Jeffries sings harmony on RAMPS. With kudos to Michael for writing this up, allow me to join the choral by capturing RAMP’s essence on a single sheet. BTW, The original Daniel Pink’s Drive: The surprising truth about what motivates us is about AMP, which I associate with AMPlifier. stay on track and adjust course if needed. 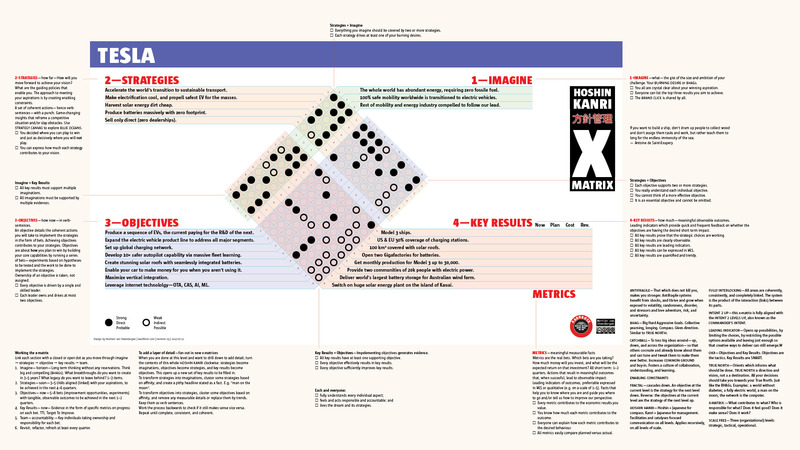 A new design of the traditional hoshin kanri x-matrix aims to make it easier to read and maintain. Rather than having upside-down and vertical tekst, the new design only uses horizontal text. 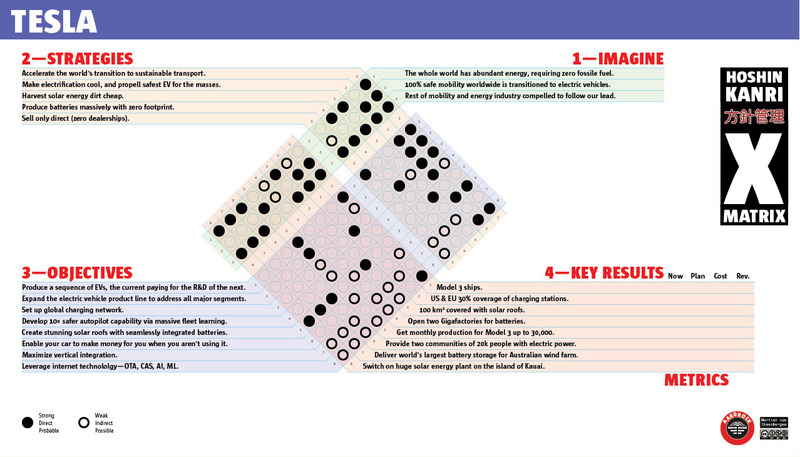 Hoshin Kanri X-Matrix example for Tesla (redesign of the 2010 version by Martien van Steenbergen; click to obtain PDF version). integrated—is integrated on all levels of your organisations, including incentive systems. Hoshin (方針) means “compass (管理), or pointing the direction,” and Kanri means “management or control”. Combined, these two words show that hoshin kanri is essentially the process for Strategic Direction Setting. Take a deep dive at hoshin kanri. Really love and fully agree with the gist of Jeff Patton’s Dual Track Development as well as Desirée Sy’s Adapting Usability Investigations for Agile User-centered Design. Throughout, there are different foci and kinds of work that are needed to evolve great outcomes. 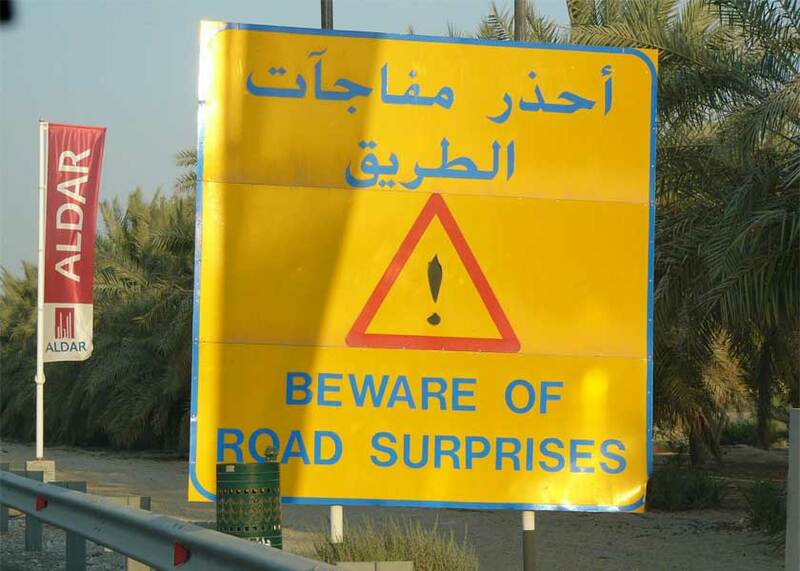 Yet, I don’t experience it as a dual track. Also, a dual track seems to split a joint effort into two groups or camps, with the danger of growing into silos and friction. My image of this important work is much more flow minded. So, more upstream you will find people whose metier it is to continuously and fast discover, create, validate, learn about, and kill lots of ideas, promoting just a few that get fleshed out until they are ready to build by people whose metier it is to develop those ideas into an ever lasting stream of shippable revisions. 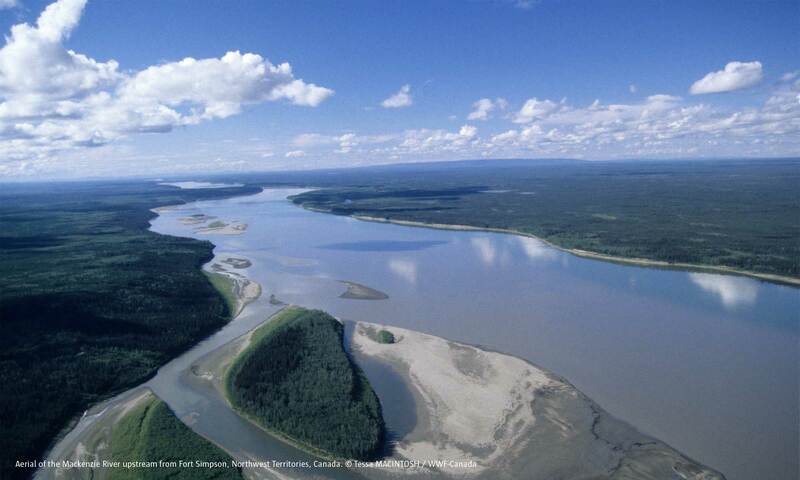 Everyone working in or on this flow aim to keep it flowing—No Business Like Flow Business™. Everyone is involved in and accountable for the flow as a whole, yet you spend most of your time in the area of your metier. Plus, you will need a some people who focus on the big picture and optimise the whole—The Flow Must Go On™. Drums is the way to start music. To me, rhythm is right up the center of music, and if you start with the drums and get that right, then all the other stuff that requires brain and hard work has a place to go and it all fits much better. It is never easy to execute a strategic shift, and doing it fast with limited resources is even more difficult. Yet our research suggests that it can be achieved by leveraging tipping point leadership. By consciously addressing the hurdles to strategy execution and focusing on factors of disproportionate influence, you too can knock them over to actualize a strategic shift. 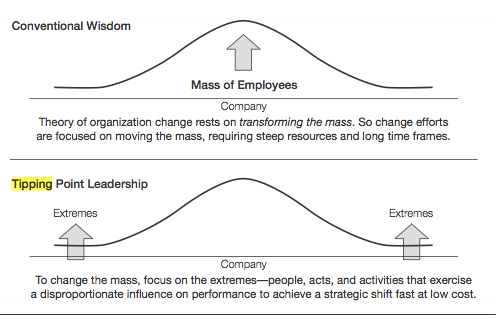 Focus on three factors of disproportionate influence in motivating employees, what we call kingpins, fishbowl management, and atomization. Place Kingpins in a Fishbowl to greatly raise the stakes of inaction—shine a spotlight on their actions in a repeated and highly visible way. Light is shined on who is lagging behind, and a fair stage is set for rapid change agents to shine. For fishbowl management to work it must be based on transparency, inclusion, and fair process. 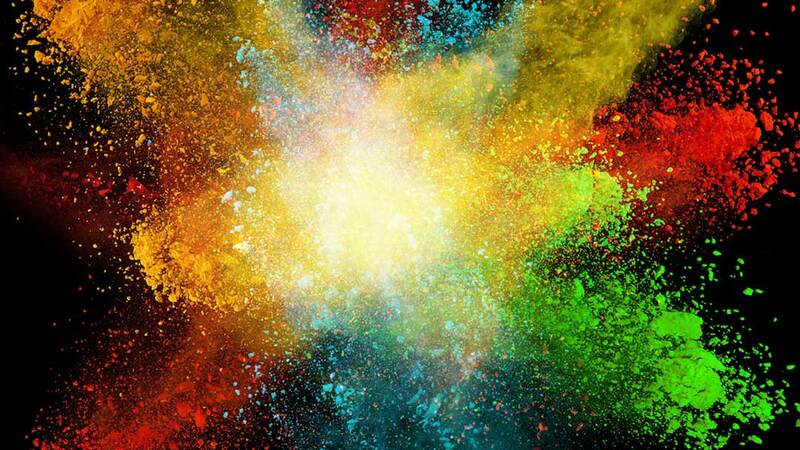 Atomize to Get the Organization to Change Itself—Atomization relates to the framing of the strategic challenge. Unless people believe that the strategic challenge is attainable, the change is not likely to succeed. Break it into bite-size atoms that officers at different levels can relate to. Atomize the issue to make it actionable to all levels. To overcome political forces, tipping point leaders focus on three disproportionate influence factors: leveraging angels, silencing devils, and getting a consigliere on their top management team. Angels are those who have the most to gain from the strategic shift (Who will naturally align with me?). Devils are those who have the most to lose from it (Who will fight me?). And a consigliere is a politically adept but highly respected insider who knows in advance all the land mines, including who will fight you and who will support you. How can you motivate the mass of employees fast and at low cost? Click on image for PDF. Certain statements in this session, such as those about future products, services and features, are “forward-looking statements” that are subject to risks and uncertainties. These forward-looking statements are based on our current expectations. As a result of certain risks and uncertainties, actual results may differ materially from those projected. Consider closing every planning session with this disclaimer. Our team disclaims any obligation to update this information. Our team obligates itself to update this information [in order to allow you to change your plans timely and accordingly]. Also known as a [https://en.wikipedia.org/wiki/Forward-looking_statement safe harbor statement]. Everything in life is a broccoli. Take a broccoli, and snap off a piece. The piece of broccoli is a broccoli in itself. Take that piece, and snap off yet another piece. Again, that piece is a broccoli in itself. In short, broccoli is self-similar. It is fractal. It is a holacracy. 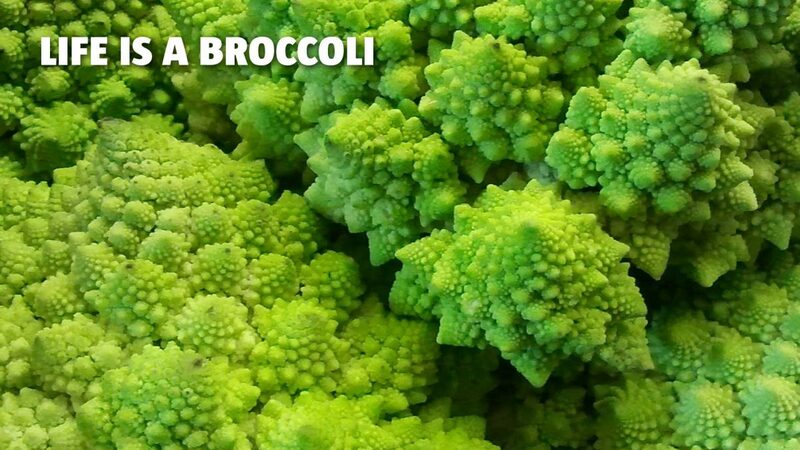 You will find broccolis all over the place. A portfolio is comprised of products. A product or a system consists of essential parts. Each part consists of subparts, and so on. An organization consists of units, divisions, departments, groups, teams, squads, individuals. All broccolis within broccolis. An initiative consists of programs, programs, in turn, consist of projects, projects have milestones, milestones take a couple of sprints to complete, sprints take one or two weeks. Actual values are the behavior and skills that are valued within the ‘fellowship’. The fellowship being the group of people pursuing some—noble—goal. The Scrum Guide from 2016 pulls the Scrum values back into its center. Ken Schwaber and Jeff Sutherland call it the heart of Scrum. How can you live all those values? Which one do you pick? Which value do you focus on? Perhaps picking your 3–5 top values, share them with your fellowship, and then dot vote the result to distill 3–5 fellowship values: behavior and skills that are valued by most or all. Abundance—The byproducts of already having abundance rather than how much. Livelihood—The byproducts of doing, rather than what you will do. Health—All that your fantastic health makes possible. Relationships—The results of having a new or an improved relationship rather than who. Appearance—The effects of being pleased with yourself rather than diets, time lines, and body weight.